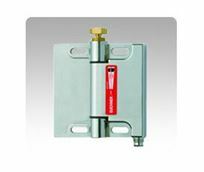 ESH hinges are safety devices for monitoring movable safety guards such as doors or covers on machinery or systems. Due to its small design, the safety hinge ESH is particularly suitable for applications in which robustness is required in combination with small dimensions. It combines the function of a door hinge with that of a safety switch. A matching plain hinge is available for support of medium and larger doors.